C. Jane Kendrick: Throw Another Blog on the Fire and Let it Snow! Throw Another Blog on the Fire and Let it Snow! Justine's Christmas card is always the first to arrive, which I think is a tribute to her active organizational skills. It gets first-place billing on our beam that separates the sitting room from the step-down lounge. All of our Christmas greetings go there. In a couple weeks time I hope the beam will be covered with cards. It shows how popular one is. I was recently talking to my friend Sarah who laid out her Christmas Card Policy and Procedure. The card must have a photo with her whole family (not just the children mind you) or else a card and photo will not be sent. I agree. Sometimes I get cards with photos of just the children and I think, "Are these the needy Christmas orphans everyone sings about?" because it's not like I can memorize all the children's faces of acquaintances. You know you can't either. Be honest with yourself this time of year. Of course, you must read through the entire Christmas letter and become educated on who learned to ride a two-wheeler this year and who is "mommy's big helper." One year, someone got fancy on us and sent us a card which required us to complete a crossword puzzle before we could be properly updated on the goings on. Like this: Tyker is now a first grader and is learning to ________ (rhymes with "feed") which of course is "read" so now I can complete 5 Across and wish Tyker well with his phonics. But here is the good news for all the family bloggers out there. When one blogs, one essentially writes a Christmas newsletter and publishes a photograph with every post. My cousin Jamie, for example, does an most excellent job of recording all the good times (with photos mind you) of her little family. I can't think of one thing she would write in her newsletter that one wouldn't already know from her blog. Their move from Arizona to Utah? I know all about it. I'm also in the know about the friends they left behind, as well as the boy's recent trip to see Santa Claus. 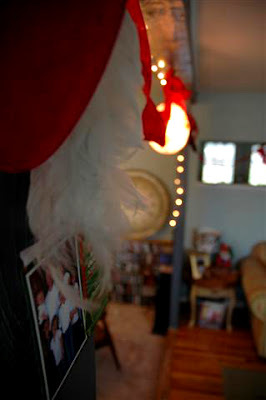 I can even peruse a slideshow entitled "Christmas in Past Years." Jamie, if you are reading this, I give you and A+.A Christmas card would be unnecessary extra credit. Save your stamp money and donate it to the Christmas orphans everyone always sings about. Futhermore, don't you think that frequently blogging should also eliminate small talk amongst friends? The question, "How are you?" would be replaced by, "I know how you are, and I am sorry that your fish died." An active blogging lifestyle cuts right to the chase, and for someone who detests small talk, I find it exhilarating. Blogging was also the easiest way to announce my miraculous pregnancy to the most amount of people in the most expedient measure of time. What in the (bleep) has happened in the last month?? YOU'RE PREGNANT???????? A sista hops on your blogspot only to discover she's the last person in the world to hear the amazing, awesome, jaw dropping news! Please forgive me for not e-mailing the news. I guess I am vain enough to think that anyone I have ever met in my life reads my blog incessantly. I have to admit that I did drop the bomb on my blog the very day we found out. That is how most everyone in my life found out. I didn't even think to e-mail. "Seasons Change, But Our Love Remains. Wishing You and Yours A Bright Holiday." See our blog for details on family life etcetera, etcetera, etcetera. P.S. Why aren't you reading our blog already? Who is looking out for you fellow bloggers? In helping you realize that you can comfortably skip the Christmas card tradition this year, I just saved you time and money. Time and money make the best Christmas presents. It is COMMENTS ON FRIDAY. Be gentle. Davey.